Former Los Angeles Laker Lamar Odom is now facing a civil lawsuit with potentially massive damages following a fight with paparazzi. 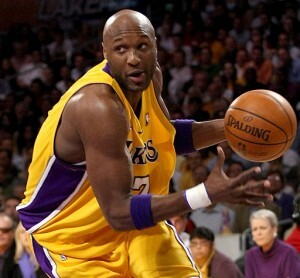 Lamar Odom used to be known for his game-changing contributions off the bench as the best 6th Man in the NBA. Then he married a Kardashian and it has been all down hill from there. Since joining the Kardashian clan and becoming a reality TV star, Odom was traded from the Lakers to the Mavericks, sent down to the D-league, arrested for DUI, and allegedly developed a crack cocaine addiction. On top of that, his wife, Khloe Kardashian has reportedly severed all ties with Odom and shut off the couple’s credit cards. Yet while Odom struggles with drugs, alcohol, and the Kardashian family, he must now defend himself against accusations of assault, conversion, and trespass to chattels following a violent run-in with paparazzi. Photographer Stefan Saad filed a civil lawsuit against Odom in the Los Angeles County Superior Court of California on September 10 seeking $15,000 in property damages, $50,000 in compensatory damages, $500,000 in damages for emotional distress, as well as punitive damages. Odom has thirty (30) days to get sober enough to hire a lawyer to file an Answer or he will face a default judgment. Perhaps most interesting about Saad’s lawsuit is not his lofty claimed damages, but the hilarious drafting of his lawyer, Justin Sobodash. 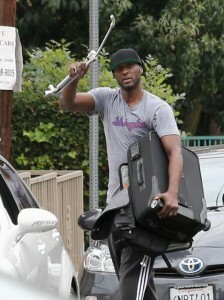 Lamar Odom threatens the plaintiff with a metal rod while carrying away his case of photography equipment. Odom’s violent temper could cost him. The entire incident was caught on tape and there is no question that Odom smashed Saad’s camera equipment and then joined the Kardashians in a social media attack on Saad. Conversion – That he owned/possessed/had a right to possess his camera equipment, that Odom intentionally and substantially interfered with the property by destroying the property without consent. Note, though, that conversion is a strict liability tort in California so Odom is likely liable for the property damage (Burlesci v. Petersen, 68 Cal.App.4th 1062 (1998)). Trespass to Chattel – That he owned/possessed/had a right to possess his camera equipment, that Odom intentionally interfered with Saad’s use or possession of the equipment without consent. If I were Odom’s lawyer I would advise him to settle this claim and pay for the property damage. The punitive and compensatory damages in this case could be huge, particularly with the wrong jury. Saad alleges that he made $2,500 per week and had to miss significant time from work due to this incident. Odom does not want to foot that wage loss claim.